Monfortinjazz: a must for all music lovers. In the natural and charming setting of the amphitheater Horszowsky, located in the old village, many of the best known and popular stars of the international music scene give birth every year, a unique event. This is confirmed by the presence of thousands of spectators in the past editions, as well as more than positive feedback from critics. 2019 edition starts with Marcus Miller, Graham Nash, Calexico&Iron Wine, Xavier Rudd and, last date 3rd August, Mario Biondi. Find out how to live an amazing cooking experience learning about traditional piedmontese food!You’ll start with a cooking class at Raffaella’s home: a restored farm in the countryside Cervere, the land of leeks.Starters, pasta, main course and dessert: with her help and your work, in 3/4 hours you will learn how to prepare a local menu with 4/5 delicious dishes. At the end, you’ll enjoy lunch with all the dishes prepared by you and your friends. From the Latin safranum that derives from the Arabic za’faran the name saffron means golden yellow, light, lighting, revealed wisdom. Saffron is one of the most powerful antioxidants in nature, capable of awakening lost energies and giving out fine and intriguing flavours to our dishes. 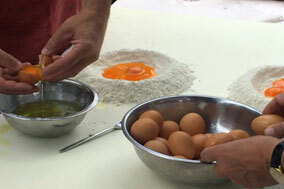 Established in 2013, the Montagliato farm was set up after 2 years of study of both product and territory. 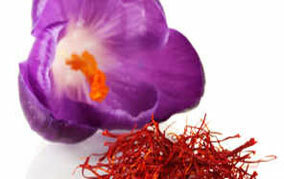 With ongoing enthusiasm and humbleness, the company Safranum currently produces the saffron ranking within the best standards required by the market. Farm visit Euro 10,00 per person. A service for bycicle lovers designed and provided by someone who rides the hills every day. Daily rental of Ebikes, upon reservation. For those who want to discover the Langa Hills but they don't like to ride alone, is possible to book in advance an italian or english speaking bike guide. 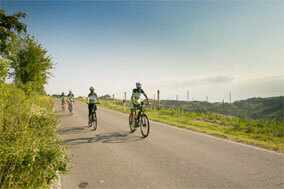 Check the new and free app Langhe4you discovering the best routes on the road or through the vineyards. 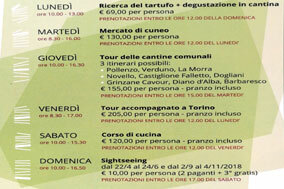 The newly arrived at Monforte Tourist Office for the tourists who want to visit the caracteristic villages, castles and wineries on Langhe and Roero land, without to miss the opportunity to visit Turin, first capital of Italy. 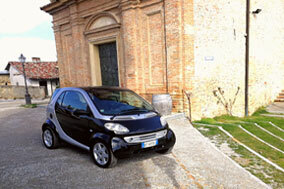 The rental includes full tank, 200 km per day and third party liability insurance. Renting on Vespa is an unforgettable experience to discover the hills and the vineyards where the famous Barolo wine is produced. 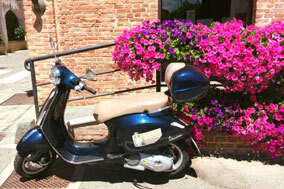 Vespa is one of the most suitable way to visit the nice Langhe villages highly appreciated from countryside lovers who can take many pictures on the way. It is possible to rent Vespa Primavera 125 including no limits km, 2 helmets, full coverage insurance and full of gasoline. 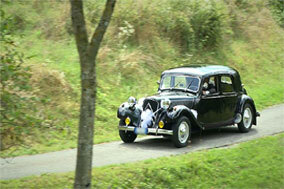 Traction Avant produced between 1934 and 1957 from Citroen, born from the genius of Flaminio Bertoni: it is the first front-wheel drive car, with monocoque frame and steel body. Maggiolone cabrio 1974, its vintage cabriolet line fitted with chrome, makes it an inimitable model. Spider 850 Bertone, produced between 1965 and 1973 from Fiat, born from an idea by Bertone designed by Giorgetto Giugiaro, a graceful vintage car with smart performances.